Most of us go through a traumatic event at some point in our lives. Whether it’s emotional or physical, it takes time for your body and mind to heal. Many people find that while physical symptoms may subside, the emotional component has to be healed too before your body can fully move on from the trauma. If the emotional part isn’t addressed, it can quickly manifest as residual negative energy in your body that follows you throughout your life. You may not always realize the energy is there or that the problem is still bothering you years down the road. This is normal, but it can have huge effects on your health and happiness. Whether the trauma was an injury or other event in your childhood or adult life, the experience can trap energy in your body long after healing. While your body may learn to handle that energy over time, stress may cause residual distress symptoms to flare up, which can be hard to ignore. If you’ve faced a traumatic event, a SomatoEmotional Release (SER) session may be what you need to start healing for good. SER is defined as a therapeutic technique to help rid the mind and body of symptoms of trauma associated with a negative experience. Practitioners like myself take a mind-body approach to find out how that trapped emotional energy caused by the trauma is influencing your health. Osteopathic physician Dr. John Upledger and biophysicist Dr. Zvi Karni founded the concept of SER in the 1970s. In their osteopathic research, they learned that the body holds in “physical forces and the emotional energy that comes with it due to some type of trauma.” When you experience trauma, an “energy cyst” is created, leading to symptoms of pain even after your body tries to heal itself. SER is often used in combination with CranioSacral Therapy (CST). SER is the process of releasing emotional memories stored in the body while CST uses light bodywork to relax the body and pinpoint the areas causing you concern. SER is introduced in a session when those tense spots are identified. From there, I use light bodywork and dialogue to help you identify the source of the energy cysts. SER/CST practitioners tend to be more experienced and have a much higher skill level than CST practitioners alone. I’ve been practicing CST since April 2014 and SER since April 2016, helping people overcome issues in their past so they can move on. In my time as a practitioner, I’ve noticed that while each person handles stress differently, SER is a great way for the body to break old habits and figure out how to heal itself. I facilitate healing though SER by responding to what the body needs so you can fully move on from your trauma. Often times, this trauma can prevent you from moving on even if you don’t realize it. It can keep you trapped in your past and even your childhood. Using SER, you can get in touch with what I like to call your “inner physician,” meaning that your body has the tools it needs to heal itself and tell you what’s wrong so you can address it. SER isn’t a one-time service that makes your negative energy go away. It’s a healing process that brings you deeper into yourself so you can overcome trauma. While you can’t change the past, you can change the grip that trauma has over your mind, body, and spirit. In your SER session, I will focus on helping you become more aware of your inner self. After your body expels the energy cysts, your mind, body, and spirit will feel at peace, ready to return to health and happiness. When you come for an SER session at Blue Moon Healing Arts, you’re in a safe environment and can feel okay to express any emotions that may arise. At the beginning of your session, I will ask a few questions to get to know you and your body better and see if you have any pressing concerns. Once you are ready and I understand your session goals, you will have the option to relax on your back or stomach. I suggest wearing comfortable clothes so I can maneuver your body and listen carefully to what it’s saying. Your comfort is very important. You will have the option to cover yourself with a blanket if it’s more comfortable for you. I will start at your feet and gently work my way up your body, listening to changes in the CranioSacral rhythm. When the rhythm stops, I will pause and massage that spot as that is where your troubles originate. During the massage, I will ask you questions to help you visualize what is bothering you and get you in touch with your inner physician. Throughout the session, I will use a combination of SER, CST, and standard massage therapy. Essential oils may be used to help relax and heal you naturally. You may experience memories of the trauma and heightened emotions as the negative energy is released. This is normal. After the session, you can expect a feeling of lightness as if a large weight has been removed from your shoulders. Once the session is complete, you will get up from the table slowly, and we will talk about my findings and how you can use what you learned to heal for good. Our bodies carry us through all parts of life. They deserve to be honored. Practice self-care and do things that make you happy. Whatever your goals are, SER has one simple purpose: to help you feel free again. 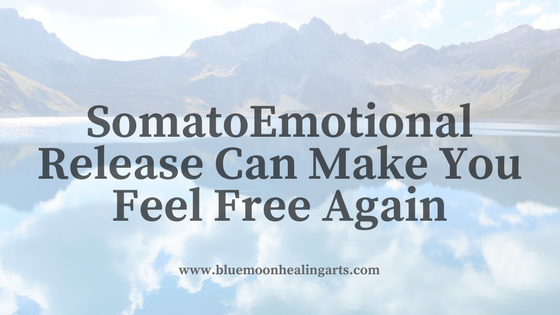 Have you experienced a SomatoEmotional Release session with me before? I’d love to hear your thoughts about it in the comments. If you are new to Blue Moon and you are currently experiencing emotional or physical trauma, book an appointment with me today at (831) 359-8395! You won’t regret it.